At Web 7 Marketing Inc, we understand the importance of modern design and SEO. Read about Industry News, SEO & Design Trends. How Much Does It Cost To Optimize A Website for Search? Are you prepared for the future of Search? We are the top web designers in Clarkston Michigan and the leading Southfield Michigan SEO company. Our Bloomfield Michigan website development firm offers the best in Michigan website design, Michigan S.E.O. and Michigan website marketing. Web 7 is a Christian owned web design firm in Michigan. We pride ourselves on delivering straight-forward and honest solutions to all of our Clients. 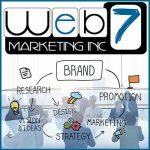 Why Web 7 Marketing Inc? We are the expert WordPress website designers in Michigan! We develop responsive mobile compatible HTML5, e-commerce, and WordPress websites. Over 90% of our new developments are on the responsive WordPress platform. SEO Firm in Michigan. Need the best in WordPress design? Looking for the best SEO service in Michigan?